29,40,560 Candidates Expected to Appear for SSC CGL 2017 Examination – As many as 30,17,468 Lakh candidates have applied for this year SSC Combined Graduate Level Examination 2016. As you know SSC CGL Exam Date has been announced. How many candidates applied for SSC CGL 2016? This is the question candidates are worrying about SSC CGL online examination these days. We have come up with little research on total number of candidates applied for SSC CGL this year and out of them how many of them are exempted for SSC CGL Exam 2017. If we go by various sources, an unanticipated response of 30 Lakh 17 thousand 4 hundred 68 applicants for the 10,000 SSC CGL posts in Indian Government (Various Departments). 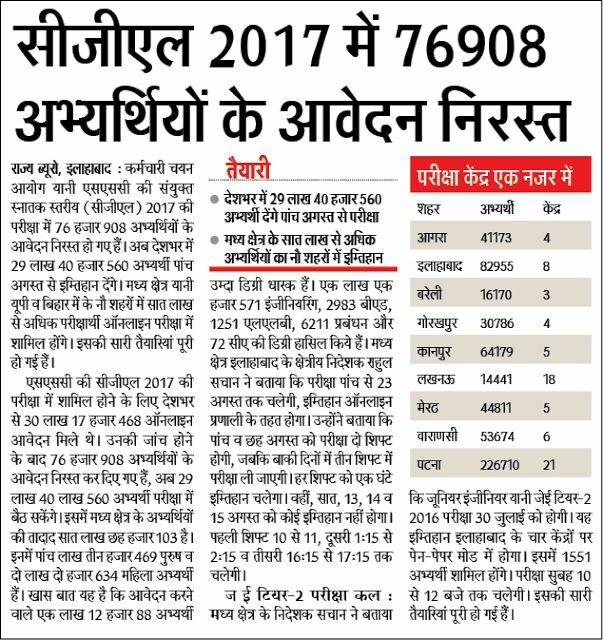 Now, a total of 76,908 Applications has been rejected in SSC CGL 2017 Examination. SSC CGL 2016 Admit card has been released as the examination has been scheduled to be held in from 5th August to 24th August 2017. As per Railway SSC CGL 2017 Application status, 15 Times/ 29 Lakhs candidates are expected to appear for SSC CGL Tier-I Online exam this year. exam will have similar fate of recently held SSC CGL 2016 and other previous year CGL Examinations. As this time the commission is going to conduct SSC CGL 2017 Tier-I exam online so that the exam can be conducted in exam in fair manner without incidences of cheating, impersonation, infrastructure problem, shortage of test papers etc. SSC CGL 2016 All Shift Question Paper. BSSC CGL 2016 All shift GK Question. SSC CGL 2016 Previous Year Solved Paper.